Chatton, É. (1925). Pansporella perplexa, amoebien à spores protégées parasite de daphnies. Réflexions sur la biologie et la phylogénie des protozoaires. Annales des Sciences Naturelles, Zoologie, Série 10 VIII: 5–84, . See Kussakin & Drozdov (1994), , Katscher (2004), . Chadefaud, M. & Emberger, L. (éds.). Traité de botanique systématique. Masson et Cie., Paris. Tome I. Les végétaux non vasculaires (Cryptogamie), par M. Chadefaud, 1960, 1 vol. de 1016 pages, . Tome II. Les végétaux vasculaires, par L. Emberger, 1960, deux fascicules, 1540 pages, , . Jeffrey, C. 1971. Thallophytes and kingdoms - a critique. Kew. Bull., 25, 291-299. See Brands, S.J. (comp.) 1989-present. The Taxonomicon. Universal Taxonomic Services, Zwaag, The Netherlands, . Margulis, L. 1971. Whittaker's five kingdoms of organisms: minor revisions suggested by considerations of the origin of mitosis. Evolution 25:242-245. Margulis, L. (1974a). Five-kingdom classification and the origin and evolution of cells. Evol. Biol. 7, 45-78, . Margulis, L. (1974b). The classification and evolution of prokaryotes and eukaryotes. In: Handbook of Genetics, Vol. 1, R. C. King, (ed. ), Plenum, New York, pp. 1-41, . Edwards, P. (1976). A classification of plants into higher taxa based on cytological and biochemical criteria. Taxon 25: 529–542. Whittaker, R. H. & Margulis, L. (1978). Protist classification and the kingdoms of organisms. Biosystems 10, 3–18. Cavalier-Smith, T. (1978). The evolutionary origin and phylogeny of microtubules, mitotic spindles and eukaryote flagella. BioSystems, 10(1), 93-114. Stewart, K.D. & Mattox, K. (1980). Phylogeny of phytoflagellates. In: Phytoflagellates (ed. E.Cox), New York: Elsevier/North Holland, pp. 433–462, , . Cavalier-Smith, T. (1981). Eukaryote kingdoms: seven or nine?. 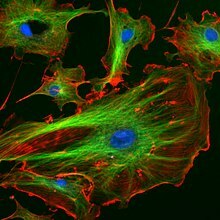 Biosystems, 14(3), 461-481, . Cavelier-Smith, T. 1983. A 6-kingdom classification and a unified phylogeny. Pp. 1027–1034 in Endocytobiology II (H.E.A. Schenk and W. Schwemmler, eds.). De Gruyter, Berlin, , . From System und Phylogenie der Lebewesen, , . Lipscomb, Diana. 1985. The eukaryotic kingdoms. Cladistics 1: 127–40. From The kingdoms of organisms: from a microscopist’s point of view. Старобогатов Я.И. К вопросу о числе царств эукариотных организмов. // Труды Зоологического института АН СССР. 1986. T. 144. С. 4-25. Starobogatoff, Y.I. 1986. On the number of kingdoms of eukaryotic organisms. Trudy Zoologicheskogo Instituta 144: 4–25 (in Russian). From Pelentier, B. (2007-2015), . Lipscomb, D. (1989). Relationships among the eukaryotes. In: The Hiearchy of Life, B. Fernholm, K. Bremer, & H. Jornvall (eds. ), Elsevier, New York. pp. 161-178, . From Pelentier, B. (2007-2015), . Lipscomb, D. (1991). Broad classification: the kingdoms and the protozoa. In: Parasitic Protozoa, Vol. 1, 2nd ed. J.P. Kreier & J.R. Baker (eds.). Academic Press, San Diego. pp. 81-136, . From An Interim Utilitarian ("User-friendly") Hierarchical Classification and Characterization of the Protists. Кусакин О.Г, Дроздов А.Л. 1994. Филема органического мира. Часть 1. Пролегомены к построению филемы. С.-Петербург: Наука, . Kussakin O.G., Drozdov A.L. (1994). Phylema of the living beings. Part 1. Prolegomena to the construction of phylema. Nauka, St.-Petersburg (in Russian). Cavalier-Smith, T. (1995). Zooflagellate phylogeny and classification. In: The biology of free-living heterotrophic flagellates (ed. S.A. Karpov), Cytology [Tsitologiia], 37 (11): 1010–1029, . Starobogatov, Y. I. (1995). The position of flagellated protists in the system of lower eukaryotes. In: The biology of free-living heterotrophic flagellates (ed. S.A. Karpov), Cytology, 37 (11): 1030–7, . Also in: Abstracts of the Second International Symposium on the Biology of Free-living Heterotrophic Flagellates: 14th – 20th August 1994 – St. Petersburg, Russia. Europ. J. Protistol. 31, 109-118, . From Archaeal-eubacterial mergers in the origin of Eukarya: Phylogenetic classification of life . From Hausmann, K., N. Hülsmann. Protozoology. 2nd ed. Thieme Verlag; New York, 1996. , . From A revised six-kingdom system of life, . КусакинО Г., ДроздовА. Л. 1998. Филема органического мира. Часть 2. Прокариоты и низшие эукариоты. С.-Петербург: Наука, . Kussakin O.G., Drozdov A.L. (1998). Phylema of the living beings. Part 2. Prokaryotes and Lower Eukaryotes. Nauka, St.-Petersburg (in Russian). Patterson, D. J. (1999). The diversity of eukaryotes. The American Naturalist, 154($1–$2): S96-S124. .
"Eukaryotic taxa without known sister groups"
From Hausmann, K., N. Hulsmann, R. Radek. Protistology. 3rd ed. Schweizerbart'sche Verlagsbuchshandlung, Stuttgart, 2003. From Protist phylogeny and the high-level classification of Protozoa, . From Only six kingdoms of life, . From The new higher level classification of eukaryotes with emphasis on the taxonomy of protists, . Lecointre, G. & Le Guyader, H. Classification phylogénétique du vivant, 3e éd., Belin, Paris, 2006, . From Megaphylogeny, cell body plans, adaptive zones: causes and timing of eukaryote basal radiations. Cavalier-Smith, T. (2010). Kingdoms Protozoa and Chromista and the eozoan root of the eukaryotic tree. Biol. Lett. 6 (3): 342–5, . Adl, S. M. et al. (2012). The revised classification of eukaryotes. Journal of Eukaryotic Microbiology 59 (5): 429–514, . Erratum: . Cavalier-Smith, T. (2013). Early evolution of eukaryote feeding modes, cell structural diversity, and classification of the protozoan phyla Loukozoa, Sulcozoa, and Choanozoa Eur. J. Protistol., 49, pp. 115–178, . Brown, M.W., Sharpe, S.C., Silberman, J.D., Heiss, A.A., Lang, B.F., Simpson, A.G.B., Roger, A.J. (2013). Phylogenomics demonstrates that breviate flagellates are related to opisthokonts and apusomonads. Proc Biol Sci 280(1769):20131755, . Pawlowski, J. (2013). The new micro-kingdoms of eukaryotes. BMC Biol 11:40, . Paps, J., Medina-Chacón, L. A., Marshall, W., Suga, H., & Ruiz-Trillo, I. (2013). Molecular phylogeny of unikonts: new insights into the position of apusomonads and ancyromonads and the internal relationships of opisthokonts. Protist, 164(1), 2-12. Boudouresque, C. F. (2015). Taxonomy and Phylogeny of Unicellular Eukaryotes. In: Environmental Microbiology: Fundamentals and Applications (pp. 191-257). Springer: Netherlands, . Derelle, R., Torruella, G., Klimeš, V., Brinkmann, H., Kim, E., Vlček, Č., Lang, B.F. & Eliáš, M. (2015). Bacterial proteins pinpoint a single eukaryotic root. PNAS, 201420657, . Cavalier-Smith, T., Chao, E. E., & Lewis, R. (2015). Multiple origins of Heliozoa from flagellate ancestors: New cryptist subphylum Corbihelia, superclass Corbistoma, and monophyly of Haptista, Cryptista, Hacrobia and Chromista. Molecular Phylogenetics and Evolution, 93, 331-362, . Silar, Philippe (2016). Protistes Eucaryotes: Origine, Evolution et Biologie des Microbes Eucaryotes. HAL: 462, . Adl, S. M., Bass, D., Lane, C. E., Lukeš, J., Schoch, C. L., Smirnov, A., ... & Cárdenas, P. (2018). Revisions to the Classification, Nomenclature, and Diversity of Eukaryotes. Journal of Eukaryotic Microbiology. .
Allsopp, A. 1969. Phylogenetic relationships of the Procaryota and the origin of the eucaryotic cell. New Phytol. 68:591-612. Baldauf, S.L. 2003: The deep roots of eukaryotes. Science, 300: 1703–1706. Baldauf, S.L., Roger, A.J., Wenk-Siefert, I., & Doolittle, W.F. (2000). A kingdom-level phylogeny of eukaryotes based on combined protein data. Science 290: 972–977. Becerra, A., Delaye, L., Islas, S., & Lazcano, A. (2007). The very early stages of biological evolution and the nature of the last common ancestor of the three major cell domains. Annual Review of Ecology, Evolution, and Systematics 38: 361–379. Cavalier-Smith, T. 1981: Eukaryote kingdoms: seven or nine? Biosystems, 14: 461–481. Chatton, É. (1925). Pansporella perplexa, amoebiens à spores protégées parasite de daphnies. Réflections sur la biologie et la phylogénie des protozoaires. Annales des Sciences Naturelles, Zoologie, Série 10 VIII: 5–84. Chatton, É. (1937/1938). Titre et travaux scientifique (1906-1937) de Edouard Chatton. Sette, Sottano, Italy. Christensen, T. (1962). Alger. In: T.W. Böcher, M. Lange, and T. Sørensen (eds.). Botanik. Bind II. Systematisk botanik. Nr. 2, 1–178. I Kommission hos Munksgaard, Copenhagen, . Fott, B. (1959). Algenkunde. Gustav Fischer, Jena, 482 p. Translation of: Sinice a řasy. Academia Praha, 1956, . Fott, B. (1971). Algenkunde. 2nd ed. VEB Fischer, Jena, 581 pp., . Translation of: Sinice a řasy. 2nd ed., Academia Praha, 515 p., 1967, . Jeffrey, C. (1971). Thallophytes and kingdoms - a critique. Kew. Bull., 25, 291-299. See Brands, S.J. (1989-2015), . Katscher, F. (2004). The history of the terms Prokaryotes and Eukaryotes. Protist, 155(2), 257-263, . Margulis, L. (1996). Archaeal-eubacterial mergers in the origin of Eukarya: phylogenetic classification of life. PNAS, 93(3), 1071-1076, . Möhn, E. 1984: System und Phylogenie der Lebewesen. I. Physikalische, chemische und biologische Evolution. Prokaryonta. Eukaryonta. (bis Ctenophora). Stuttgart: E. Schweizerbart'sche Verlagsbuchhandlung. Murray, R. G. E. 1968. Microbial structure as an aid to microbial classification and taxonomy. SPISY (Faculté des Sciences de l'Université J. E. Purkyne Brno) 34: 249–252. Novák, F. A. (1930). Systematická botanika. Praha. Novák, V. J. A. (1969) Historický vývoj organismů. Praha, . Moreira, D., von der Heyden, S., Bass, D., López-García, P., Chao, E., & Cavalier-Smith, T. (2007). Global eukaryote phylogeny: combined small- and large-subunit ribosomal DNA trees support monophyly of Rhizaria, Retaria and Excavata. Molecular Phylogenetics and Evolution 44: 255–266. Round, F. E. (1973). The Biology of the Algae. 2nd ed., Edward Arnold, London. Sapp, J. (2005). The prokaryote-eukaryote dichotomy: meanings and mythology. Microbiology and molecular biology reviews, 69(2), 292-305, . Simpson, A.G.B. ; Lang, B.F.; Dacks, J.B.; Leigh, J.W. ; Hug, L.; Roger, A.J. ; Hampl, V. 2009: Phylogenomic analyses support the monophyly of Excavata and resolve relationships among eukaryotic "supergroups". PNAS, 106: 3859–3864. Steenkamp, E. T., Wright, J., & Baldauf, S. L. (2006). The protistan origins of animals and fungi. Molecular Biology and Evolution 23 (1): 93–106. Stent, G. (1971). Molecular genetics. An introductory narrative. W.H. Freeman, San Francisco, Ca. Whittaker, R. H. & Margulis, L. 1978: Protist classification and the kingdoms of organisms. Biosystems 10, 3–18. Woese, C., Kandler, O., & Wheelis, M. (1990). Towards a natural system of organisms: proposal for the domains Archaea, Bacteria, and Eucarya. Proc. Natl. Acad. Sci. U.S.A. 87 (12): 4576–4579. Wegener Parfrey, Laura 2009. Taxon page for Eukaryota. In: The ATOL eutree hypothesis First Created: 2009–07-04T15:11:59Z. Last Updated: 2009–07-04T15:14:20Z. 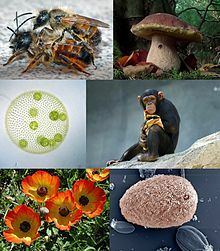 For more multimedia, look at Eukaryota on Wikimedia Commons.